Sunday for me is a day of eating junk. A full English breakfast is something I always look forward to but lately I have been finding myself wanting something a little healthier but still somewhat indulgent. I could have gone with omelette but I wanted to try something new, so off I went to the kitchen, pulled out the same ingredients I’d put in an omelette and prayed for the best. The result was actually really tasty and went down a treat with both me and my picky husband. In an ovenproof dish lay out your spinach, then add the cherry tomatoes on top and the avocado. Add your herbs, salt and chilli and mix well. Crack your eggs one next to the other and grate some cheddar and Gruyere on top. Sprinkle some paprika and some pepper and drizzle some olive oil on top. 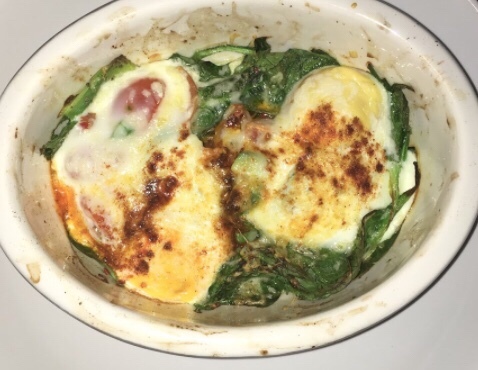 Bake it in the oven for 15-20 minutes making sure your eggs are cooked throughly. And enjoy. You can add whatever vegetables you like, I personally am looking forward to adding some mushrooms to the mix.